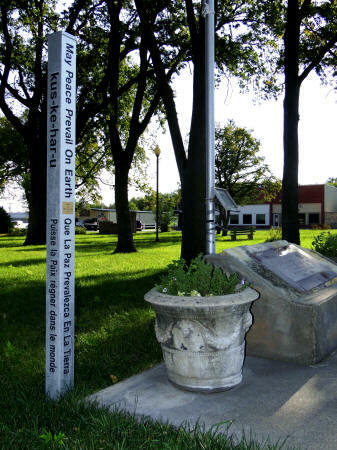 The SV24 Alliance traces the settlement of the Solomon Valley to the post-Civil War search for peace, and in this spirit the Alliance elected to place a Peace Pole in the valley to mark Kansas’ 150-year observance. Glen Elder accepted this honor, with the peace monument being placed in their Town Square there. This process has renewed acquaintance with Clarence Pickett, whose family came to Glen Elder when he was a child. Pickett went on to a remarkable career of public service. He was the Secretary of the American Friends Service Committee for 22 years, providing strategic leadership for AFSC’s work. The 1947 Nobel Peace Prize was awarded to AFSC. The eight languages selected for the four-sided Peace Pole are Czech, English, French, German, Kaw, Norwegian, Pawnee, and Spanish. Each says “Let peace prevail on Earth. The Peace Pole dedication, July 21, 2012, at Glen Elder was a fine culmination of our year-long quest to mark Kansas' 150 years in a significant way. The SV24 Heritage Alliance greatly appreciates the support of Glen Elder for serving as the host site and organizing the moving dedication event. Kent Anderson provided the background story of Clarence Pickett, a key figure in the American Friends Service Committee receiving the Nobel Peace Prize in 1947. Pickett grew up in Glen Elder. Linda Clover, vice-president of the alliance and Glen Elder native, accepted the gift of the Peace Pole on behalf of the community and reviewed the process involving community members in selecting the eight languages on the pole. The Peace Pole is located next to the American flag in the Glen Elder park. We hope everyone will stop to see it. There was a good response in financial gifts to help the SV24HA make this project possible. Heartfelt thanks are extended to all who contributed! Gifts are still being accepted for the Peace Pole. Please send them to our treasurer, Alan LeSage, designating their purpose.